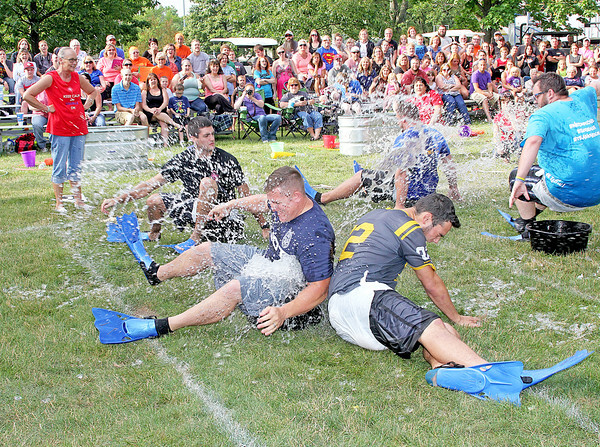 SPLASHDOWN: Contestants from the Buffalo Wild Wings and Lebanon Police Department teams battle for an ice-filled bucket -- while clad in adult diapers -- during the first event at the Adult Almost Anything Goes contest held Thursday evening at Lebanon's Memorial Park. In a tight contest, the Lebanon Fire Department team of Jon and Lindsey Bankert, Noah and Brooke Rincker, Jacob and Courtney Fussell and Alex Knipp edged the Lebanon police team. The Freedom Church squad placed third.